PAPA RECIPE Bombee Black Honey Mask contains Propolis Extract, Manuka Honey, Royal Jelly Extract and Ceramide to deeply moisturise, tighten pores and protect your skin. Suited for all skin types. Highly recommended for dry, rough skin and acne prone skin. If you purchase this product you will earn 5 Points! This moisturising sheet mask will nourish your skin with Propolis, Manuka Honey and Royal Jelly! This Gold Complex Formula is rich in antioxidants, vitamins and amino acids that protect, soothe, heal and rejuvenate your skin. Ceramide helps to retain all the moisture and keeps your skin plump. 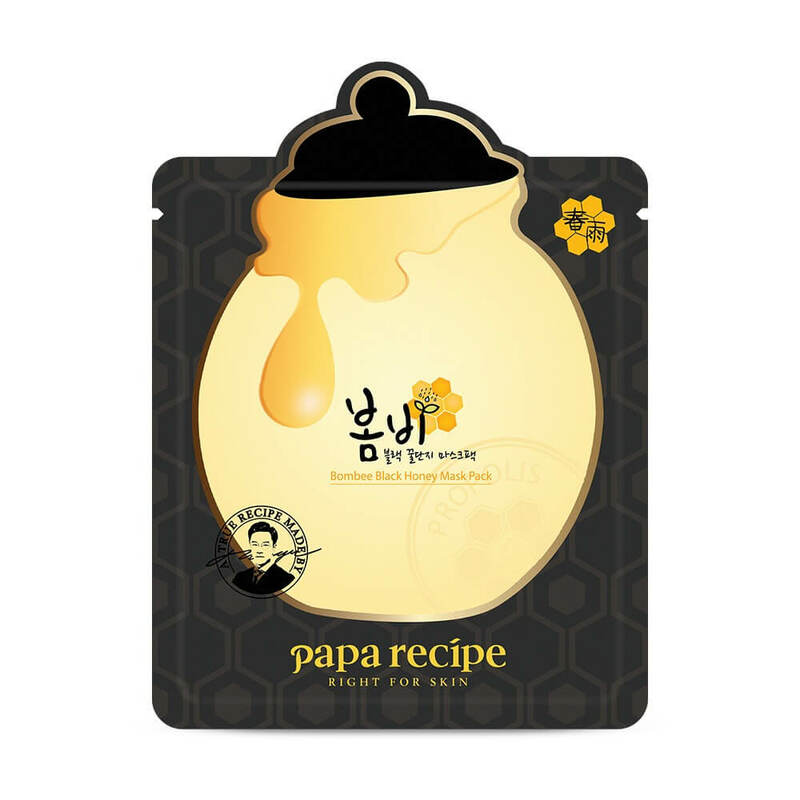 Papa Recipe Bombee Black Honey Mask is also formulated with Peat Water which improves skin cell turnover as well as tightens your pores. Propolis Extract – the high concentration of propolis provides instant hydration and moisture to the skin. It also has antibacterial and antiseptic properties to protect your skin and fight bacteria from acne. Manuka Honey Extract – promotes long-lasting hydration that leaves the skin soft and moisturised. It contains antibacterial properties that removes impurities and treats skin imbalances. Royal Jelly Extract – more concentrated with nutrients than Propolis and Honey, and high in amino acids, minerals and vitamins. Royal Jelly has natural moisturising, anti-inflammatory and antibiotic properties. It will keep your skin plump, improve wrinkles, reduce inflammation and promote skin regeneration. This is a natural, cruelty-free formula. Free from: parabens, sulphates, dyes, fillers. See our entire PAPA RECIPE range here. Remove the mask after 20-30 minutes and pat the remaining essence into your skin. Water, Dipropylene Glycol, Methylpropanediol, Propanediol, Hydroxyethylcellulose, Glyceryl Acrylate/Acrylic Acid Copolymer, Propylene Glycol, PVM/MA Copolymer, Trehalose, Polysorbate 20, Panthenol, Carbomer, Arginine, Disodium EDTA, Allantoin, Dipotassium Glycyrrhizate, Hyaluronic Acid, Royal Jelly Extract, Propolis Extract, Hydrogenated Lecithin, Ceramide NP, Caprylic/Capric Triglyceride, Cholesterol, Peat Water, Butylene Glycol, 1, 2-Hexanediol, Caprylyl Glycol, Licorice Root Extract, Schizandra Chinensis Fruit Extract, Coptis Chinensis Root Extract, Zingiber Officinale (Ginger) Root Extract, Camellia Sinensis Leaf Extract, Citrus Grandis (Grapefruit) Seed Extract, Acorus Calamus Root Extract, Perilla Ocymoides Leaf Extract, Fragrance. Papa Recipe was founded in 2012 by a doting father, Kim Han-gyun. His first daughter was suffering from atopic dermatitis and he sought to help her condition. Originally only manufacturing and selling Jojoba Oil, Papa Recipe soon expanded into creating skincare that could be used by everyone, including children. Its brand philosophy is that “good skincare lies in good ingredients” which can be found in nature. Now, it is a worldwide recognised Korean beauty brand that still maintains its philosophy as well as being environmentally sustainable.